London, United Kingdom: Today we celebrate the International Youth Day all over the world. This year there is “Safe Spaces for Youth”, as Youth need safe spaces where they can come together, engage in activities related to their diverse needs and interests, and actively participate in decision-making processes. "On International Youth Day, we celebrate the unique contributions of youth and seek to empower young people building the inclusive, peaceful tomorrow we all aspire to attain. Creating the space for youth to lead and deliver on their potential - including protecting safe spaces for civil society leadership - is the epitome of progress and a prerequisite to sustainable development." Said Ms. Julia Blocher, IYF Vice President. “Investing in youth’s empowerment is intrinsic to achieving the Sustainable Development Goals. It sets a direct path towards a better future free of poverty, and full of inclusive economic growth.” Said His Excellency Ambassador Saeed ZAKI, IYF Secretary-General. On this International Youth Day, let us celebrate generational interdependence, and recognize that all members of society have contributions to make and needs to fulfill. Intergenerational solidarity means they can do it together. 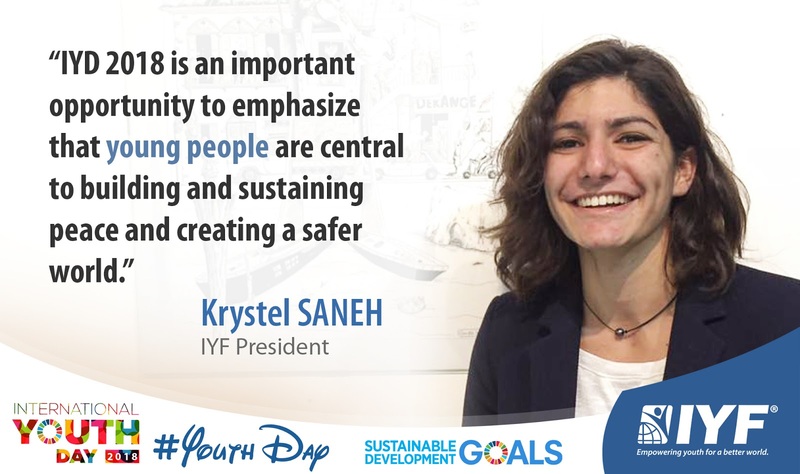 We encourage everyone celebrating International Youth Day, including the many young people gathered in IYF Member Countries for the national celebrations. Let us draw on the talents and wisdom of all people, and build peaceful societies for all ages. We all need to accelerate our efforts to achieve empowered youth communities by 2030. This day is a chance to stay engaged, keep the ambition high and work together in our collective endeavour for a better and more just future for all of us. The International Youth Federation is an international non-profit youth organizations network governed by the present Statutes and the Swiss Civil Code. It is neutral politically, and non-denominational, aim to empower youth worldwide through improving the status of youth and promote cooperation between youth organizations in different countries.